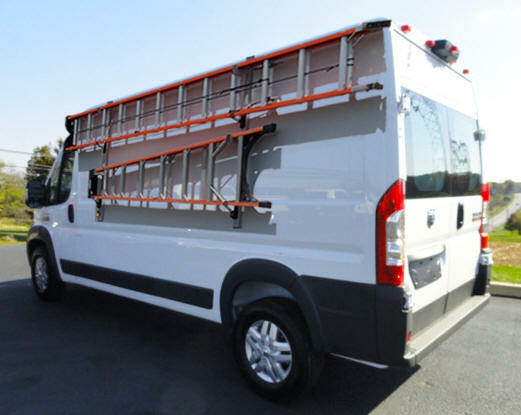 VertiRack's Ram ProMaster Side Mount Rack offers users of ProMaster high roof vans an alternative to roof mounted and drop down ladder racks. Side mounting a one or two ladder rack improves accessibility of the ladders while keeping them secure during transport. VertiRackTM manufactures Ram ProMaster side mount ladder racks in one and two ladder configurations. Optional ladder lock assemblies are available to protect your ladders from theft. There is even an optional conduit/pipe kit to fit any extra rack space if so desired. VertiRackTM ProMaster Side Mount Ladder Rack.